As the days get shorter and the weather becomes more unpredictable many will find themselves heading indoors and parking their bike on the trainer in front of the TV, pedaling away the winter months, counting the days until the snow starts to recede and the days once again lengthen out. It takes real dedication and motivation to want to climb on your bike and pedal in place for hours at a time. After a summer/fall spent riding through beautiful countryside and getting to know every back road, every hill climb, and every town-sign sprint, being cooped up in a basement, garage, wherever your indoor sessions are relegated, can be a demoralizing experience. The best way to combat trainer blues is to make the most of the training space. Think back to your bedroom when you were a teenager. It was your sanctuary; the only place in the house that you felt like you could had some modicum of control. You plastered the walls with your favourite bands, set up your stereo, kept your favourite possessions on a shelves, tokens of your interests at the time. Think of your training space like that old bedroom (you might even still have that old Led Zeppelin poster kicking around in the attic somewhere). Your cycling sanctuary will probably smell just as bad as your teenage bedroom but instead with the aroma of sweat and suffering rather than a pile of dirty laundry and teen angst. Regardless of what you do with it, make it a place in which you want to be. In this post we’ll go over some of the basics that every training space should have and some helpful optional fixtures. First let’s setup the space. If you are limited for space your training sanctuary might have to double as a living room, bedroom or garage. In this case try to make a spot out of the way where you won’t have to move the bike and trainer around too much –or at all. Cordon off the area with an invisible boundary if need be. The more fixed your training space is the more likely you’ll use it. If you have to push the bike out of the way or tear down the setup every time you ride, the less likely you’ll actually ride. Make it a fixture that beckons you to get off the couch and get on the bike. The first thing to get is a mat. It should be something that wont absorb sweat and that you can easily wipe down at the end of a session. A mat will absorb some of the vibration of the trainer and help dampen the sound (particularly useful if you have neighbours below you). It also acts as a sweat guard for carpet and hardwood and prevents damage to your floors from the cleats of your cycling shoes. The friction from the resistance unit on the tire can also cause little flecks of rubber to spatter around the bike. Trust me: its very difficult to clean the spatter off a floor. Next you need a stand of some kind to place in front of the bike. This is where you can set up your laptop and speakers for watching something while riding. You want it high enough so that your eye line is approximately where it would be if you were looking ahead on the road. Even if you have a TV mounted on the wall, the stand is a good place to put your food, gels, extra bottles, tools, whatever else you might need access to while riding. If you have ANT+ enabled devices (HRM, Spd/Cad, Power meter etc), you can use the ANT+ dongle (buy one if you don’t have it, they’re not expensive) and have your metrics displayed on the laptop screen through a program like Trainer Road. This means you won’t be looking down at your head unit the whole ride. You’ll probably need a set of computer speakers as most laptops don’t have enough volume to hear anything over the trainer and the fan. 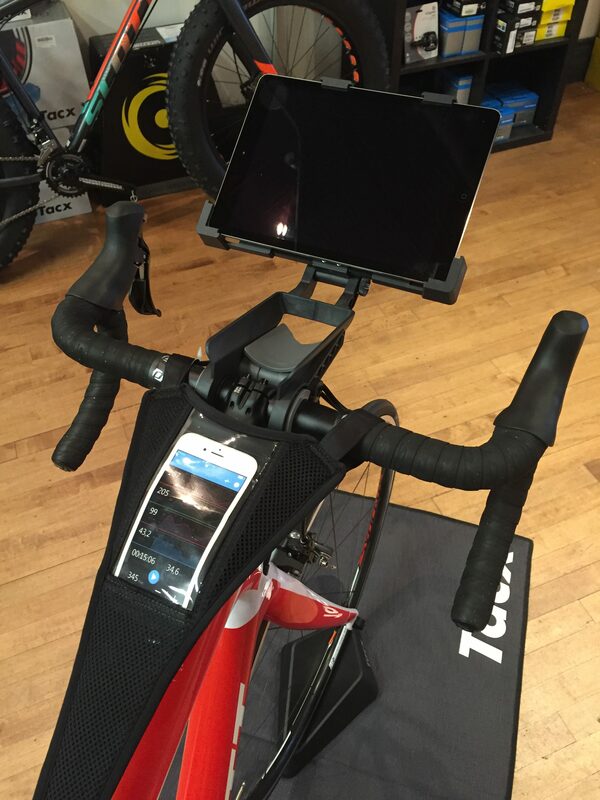 For those using tablets to monitor their training metrics, Tacx makes a holder that attaches to your handlebar like a Garmin mount and places the tablet at the perfect height for viewing without obstructing your view of the TV. Speaking of fans… we recommend something 18″ or larger. You want it to be able to move a lot of air really fast. Both you and the trainer generate a lot more heat than you probably realize. If you’re in a confined room it can quickly turn into a sauna. Having the fan placed directly in front of you also helps to simulate real road conditions and make the ride feel less stationary. Without a fan you will sweat profusely. Working out in a room that has poor ventilation or without a fan can cause significant increases in heart rate and exertion and skew your training metrics. Stay cool! In addition to a fan you can alleviate some heat generation by getting a direct drive trainer which has a dedicated powered resistance unit. Fluid and mag trainers rely on friction to provide resistance which can generate signifncant amounts of heat. 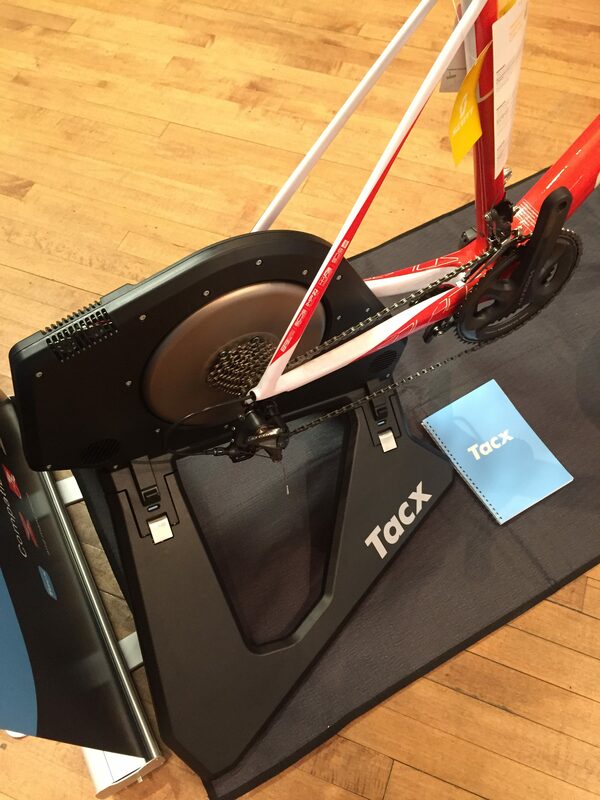 Check out the Tacx Neo for direct drive trainers. If you have the space, set up an area directly beside the trainer for a yoga mat. Now you have a place to stretch and do your off the bike workouts. Finally, get some pictures or decorative elements for the space like a motivational poster (Shut Up Legs is a great one) or even post up a course profile/route of the big A race you have coming up. Put your season goals on post-it notes and stick them on your tablet, TV, laptop screen. Surround yourself with the culture of cycling. Watch racing videos while you’re riding. They’re incredibly motivational and don’t require you to pay attention to dialogue as you would a move or TV show. I find watching TV shows and movies makes the time go by really slow. This is especially true when you’re doing a long hard effort and the program you’re watching has a lot of slow parts with boring dialogue. It becomes tedious. Watching Froome and Contador battle it out on the big Pyrenean climbs is much more motivational. On the other hand, some people like to challenge themselves by limiting their TV watching to only when they’re on the bike. You want to watch the new season of GoT? Get on the bike! Do whatever works best for you and own the space. Make it a cycling haven. You’ve set up your training space and now you want to ride. Before you hop on and get going with your winter training, there are some important considerations to be made about your trainer setup that will make your indoor training experience more enjoyable and may even save you some money and headaches down the road. If you are using a traditional trainer, you’ll want to get yourself a trainer tyre. Some folks prefer to use a dedicated wheel on the trainer, (i.e. thats the rim, spokes and hub assemblage) whereas others just replace the rubber with a special trainer tyre and use their normal wheels. While I strongly recommend a trainer tyre, if you take proper precautions you won’t need a whole different wheel. The rubber compound of the of trainer tyre is harder than a standard road tyre and therefore will not succumb to melting and wear as badly as a road tyre will. The steel roller of the resistance unit against the tyre generates an incredible amount of heat and you will start notice black goop building up on the roller if you use a standard tyre. In addition, rubber-dust will spray everywhere. This will happen with a trainer tyre but there will be much less mess in the end. The solution to all these problems, as mentioned previously, is to get yourself a direct drive trainer. No wheel or tyre is required. Just take your rear wheel off and place the bike on the trainer. It works the same as if you were swapping wheels. Once you have a tyre you need to set the trainer up so the bike fits comfortably on the trainer and will not come free while riding — when this happens it is not a pleasant experience. Some trainers come with their own skewers to replace the skewer in your wheel and I highly recommend using the provided skewers. Each trainer, too, has its own method of fixing the frame to the trainer and you’ll have to refer to the manual for how to do that. Whatever method your trainer uses, they typically all compress the skewer of the wheel that holds the bike in place. The amount of tension to place on the bike should be as minimal as possible. You shouldn’t have to force the mechanism into place nor should the bike wiggle freely when locked into the trainer. 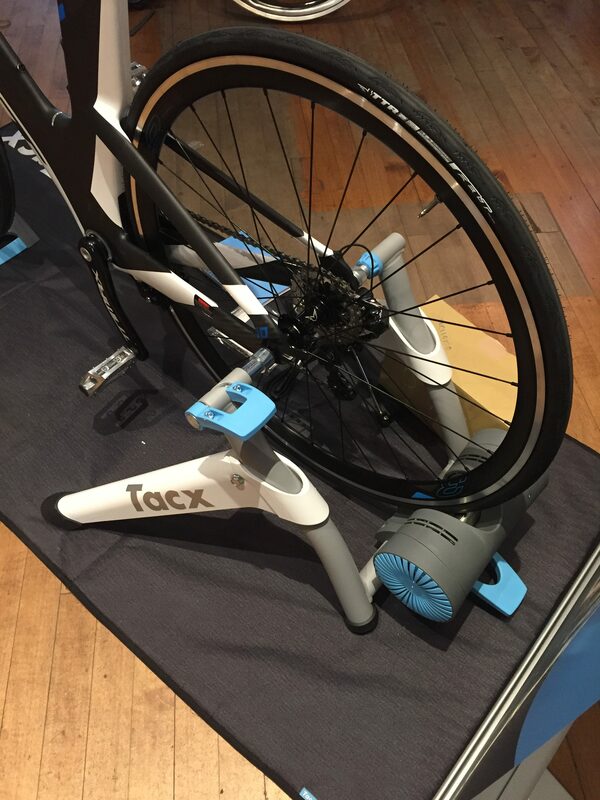 On direct drive trainers, the bike fixes to the trainer using a skewer in the same wheel you would put a wheel on. The amount is tension is the same as required to hold a wheel in place. Now that the bike is firmly locked into the trainer you can apply the resistance unit to the rear wheel. Typically this is done by turning a dial, which tightens the steel roller against the tyre. The precise amount of pressure to apply varies but you want enough tension that the tyre doesn’t slip while riding. Don’t apply too much or you’ll find yourself having to work very hard to turn the pedals even in the lowest resistance setting. If you’re using Trainer Road with virtual power, you may have to do some research about how much tension and the optimal tire pressure to get the most accurate power reading. It is imperative that at the end of each session you relieve tension to prevent a flat spot on the rim and to prevent deformation of the rubber. Beyond all that there are few additional accessories you should have in order to make the most of your sessions. The first is a sweat guard. It runs from the handlebars back to the seat post and protects the frame and components from sweat. You’ll find very quickly that all the bolts, which are typically made of steel, will start to show signs of corrosion, particularly the headset cap bolt, if you do not use a sweat guard. The second is a riser block for the front wheel. Some trainers come with these but most times you have to buy it separately. I used a stack of books for years but a dedicated riser block that stabilizes the front wheel is much more effective. I still keep a stack of books nearby to put under the block if I want to simulate climbing. Make sure that at the end of each session (or the beginning of each) you rotate the front tire so that the your body weight isn’t always on one spot on the wheel. This can lead to a flat spot on the rim and you will need to have it trued.